Researchers have pinpointed the strong acid site of a sulfated-zirconium MOF catalyst by identifying a specific molecular decoration within its structure. The work could aid studies into solid acid-catalysed reaction mechanisms as well as the development of next-generation solid acid catalysts for many industrial applications. 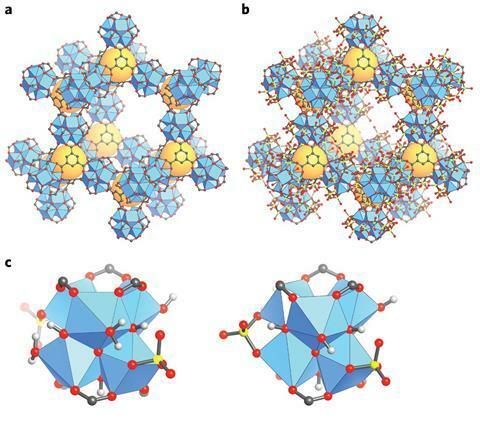 In 2014, scientists found that MOF-808 – a zirconium-based metal-organic framework – could be washed with sulfuric acid to produce a promising next-generation solid acid catalyst (MOF-808-SO4). However, despite several proposed models, the acid site in the material has remained unknown, thereby limiting attempts to modify and optimise the catalyst. Part of the problem is that it is generally difficult to gain precise knowledge of the surface chemistry of solid catalysts due to disorder and complexity within the material. The advantage of MOF-808-SO4 is that it has a highly ordered crystalline structure of zirconium clusters. But efforts to locate the acid site have been hampered because the zirconium cluster surfaces still possess a disordered arrangement of hydroxides, sulfates and water molecules that differ from one cluster to the next. The team first used x-ray diffraction and NMR spectroscopy to characterise the molecular species that decorate the zirconium cluster surfaces, which allowed them to produce an average molecular formula for the activated form of MOF-808-SO4. By knowing the formula, it narrowed down the possible species that decorated each zirconium cluster that could be responsible for the acidity. Further experiments and analyses using density functional theory revealed that the Brønsted acid site arises from the hydrogen bond pairing of water and chelating sulfate that are supported on two neighbouring zirconium atoms and share a weakly bound proton. The existence of this structure was confirmed using a nuclear magnetic resonance technique that looks only at close pairs of protons. ‘Water is a molecule most of us are familiar with, so I think its surprising to see that it can take on borderline superacid character when its arranged in the correct way with sulfate on the surface of a zirconium cluster,’ says Popp. Experiments with hydrated and dehydrated MOF-808-SO4 to catalyse the dimerisation of isobutene to isooctene – an industrially relevant process for making the gasoline octane booster, isooctane – further confirmed the importance of water for its acidity and catalytic power.